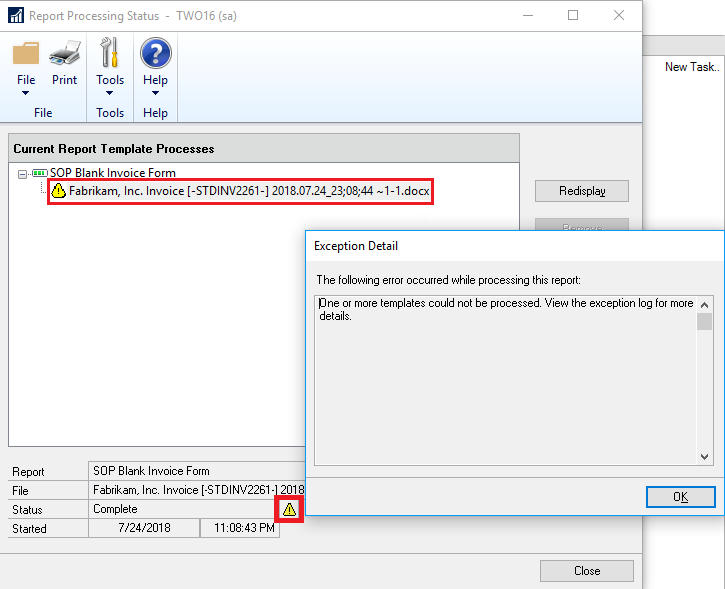 Working recently on an issue, I ran into a situation where I would get the following template processing error attempting to print a SOP Invoice - if you look at the bottom status bar, next to the user ID, you will see a Template Processing accompanied by a yellow warning triangle. One or more templates could not be processed. View the exception log for more details. File Not Found:"C:\Users\\AppData\Local\Temp\SOP Blank Invoice Form Template.docx". 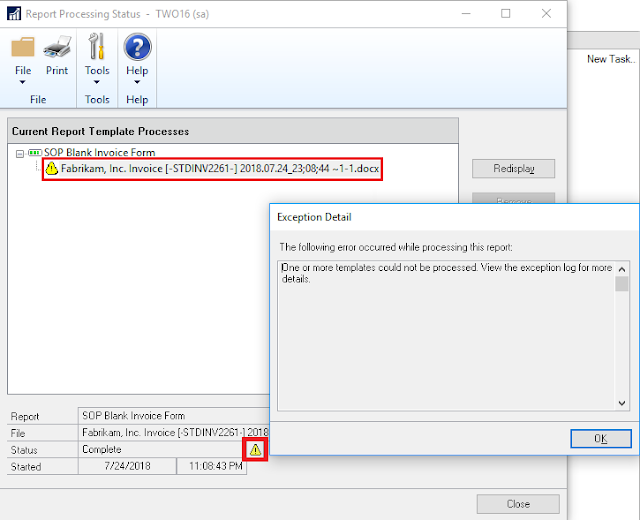 Processes are currently being run that cannot be deleted. These processes must be run to completion before you exit. Microsoft Dynamics GP Add-In for Microsoft Word is installed - Check! Microsoft Office 32 bit is installed - Check! Open XML SDK 2.0 for Microsoft Office is installed - Check! One thing I noticed was, when I opened Word, the Microsoft Dynamics GP fields object would not appear on Microsoft Word's ribbon. This was a sign that something was not right, considering I had the GP Add-In for Microsoft Word installed. 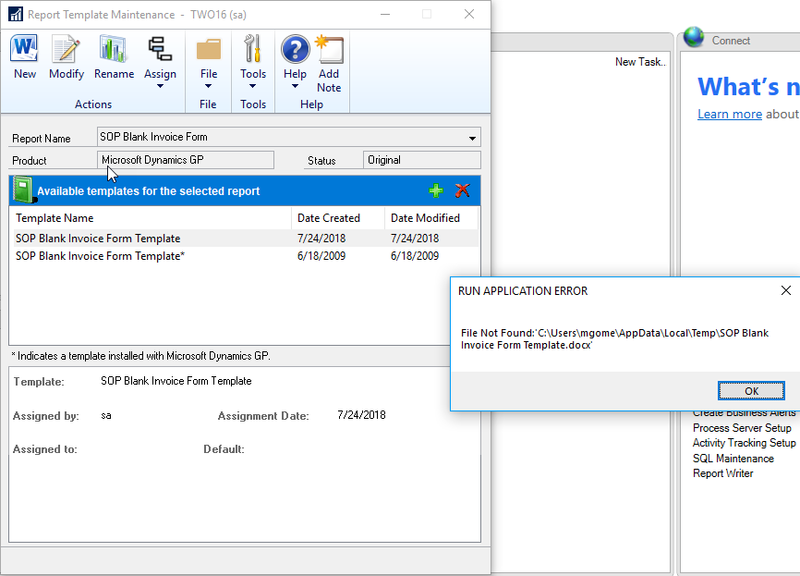 I ran a repair on Microsoft Dynamics GP and this did not solve the problem either. Upon further inspection, I noticed I was missing the Dexterity Shared Components 16.0 (64-bit). 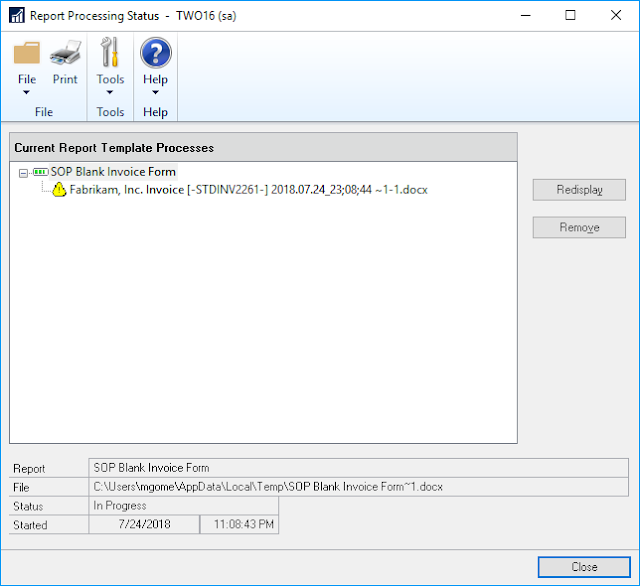 In my system, I ran several versions of Microsoft Dynamics GP and I had Dexterity Shared Components for all but the Microsoft Dynamics GP 2016 version I was trying to print the invoice from. Once Dexterity Shared Components was installed, I went ahead and gave it a try once more and everything worked as expected.